As Megs mentioned I am currently in LA and I have to say, it is wonderful out here. While Megs and Vlad watched our beloved Ohio State Buckeyes choke on tv, I was at the game with some roommates from college. We could barely believe our eyes, but, we have to give USC some credit – their team has quite a bit of talent! Either way, I couldn’t help myself from doing a little people watching. The USC fans were supporting their team while carrying some rather amazing handbags. I did notice a few bags that had a “punk” vibe going on. So, as I began thinking about what to write about today, I found a bunch of handbags that mimicked the look I saw at the game. 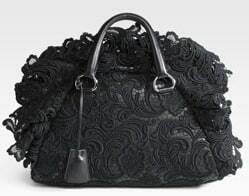 I am all for a little lace here and there, but this Prada Pizzo S Satchel does nothing for me. The handbag is classified as punk, but it just looks like a decent idea went wrong. I can hardly appreciate the bag because every time I do look at it, all I see is the lace overlay. You know, now that I think about it, if the bag had less lace, it would be a total hit. Furthermore, I could see the lace getting snagged from daily wear and tear. But, at the same time, yes, I can see the punk vibe. I haven’t see anyone sporting this handbag out here, but maybe I will soon. So, what do you think – if you are looking for a handbag with a little punk or attitude, would this Prada bag be the one? Buy through Saks for $1,995.00.